myZone Canada Full color 3/4″ Tyvek wristbands are shipped within 5 business days of placing your order with shipping available to anywhere in Canada, making full color 3/4 inch Tyvek wristbands the ideal solution when you want something to arrive fast! These full color 3/4″ Tyvek wristbands bands are durable, comfortable, cheap, tamper-proof & waterproof. They also come standard with consecutive serial numbers and a die-cut adhesive closure for increased security. This is a great solution for those who want to keep track of how many people are attending their event. As an added bonus, our full color 3/4 inch Tyvek wristbands are extremely comfortable and are 100% water resistant. For orders of quantities of over 10,000 per colour you also have the option to pick the serial numbers on each band. Want an even larger surface area? 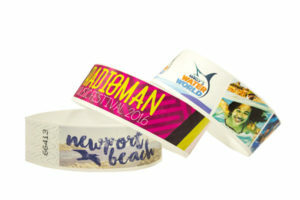 Check out our full color 1″ Tyvek wristbands!